India Ports Global has signed a contract with Aria Banader of Iran to equip and operate two terminals at Chabahar - Shahid -Beheshti Port in Iran for transportation of goods and other purposes. 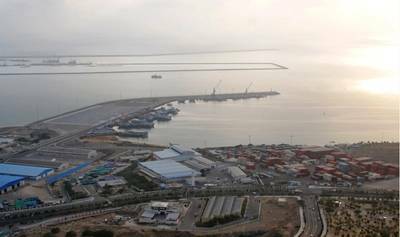 "As per Article 6 of the contract, effort are to be made to commence commercial operations at Chabahar –Shahid- Beheshti Port in Iran within 18 months from the contract activation date or 4 months from the date on which the Lessor hands over the Terminals and the infrastructure facilities to the Lessee in accordance with the terms of the Contract," said a press release from the government. India Ports Global Private Limited (IPGPL) is a joint venture between Jawaharlal Nehru Port Trust (JNPT) and Kandla Port Trust (KPT). The Ministry of Shipping has presently assigned IPGPL the task of equipping and operating Container / Multi-purpose Terminals at Chabahar in Iran. Lying on the Gulf of Oman along the approaches to the Straits of Hormuz, the port of Chabahar is central to India's hopes to crack open a transport corridor to Central Asia and Afghanistan that bypasses arch-rival Pakistan.